Each and every email you send has the ability to have a positive impact on your business and as a result, on your life. I know that’s a big bold statement and one you probably don’t believe, and there is a lot of hype on the internet, and that certainly isn’t me. But I believe that using emails to reach and connect with your audience is business and life changing.Using email marketing I was able to generate an income of at least $5,000 per month over my 4 month maternity leave. I wasn’t at my computer at all, the whole system was set up prior and ran without me. For this reason, I only want to share strategies with you that will actually work and make an impact on your business. I believe that email marketing is one of the fastest way to build a relationship with your audience and sell more of your products. You see, it doesn’t really matter how people find you, but once they have found you, then you need to seize the opportunity and make sure you follow up with them. It’s your responsibility as a business owner to stay top of mind with these people and convert them into paying customers. Using emails to follow up, allows you to leverage your time by following up with many at once, and what I really love is the fact that you can rewrite most of your emails and then make tweaks where required. During my maternity leave I didn’t touch the emails at all. In this article, I want to outline what you need to include in each and every email you send. If you specifically want to increase sales, then you need a specific follow up process and I’ve outlined these emails in my free ebook below. Back to your email writing. In each and every email, it’s vitally important that you ensure all essential elements are included. There are only 5 elements and I’ve outlined them below for you. The first step to getting your message read, is to get the email opened. When you are scrolling through your inbox, what helps you decide if you open the email. Yes, the subject line. I’ve read that the average adult receives 147 emails a day plus Facebook notifications, Tweet alerts and Instagram hearts. Wow. That’s a lot of potential distractions for your audience. And these are just the ones on their computer or phone. We haven’t even started talking about partners and kids! Your subject line will help you cut through the clutter and many great copywriters say you should spend 80% of your time just on the subject line. While I personally don’t do that, I do give it some serious thought. I ask myself “what would I click on?” Next time you are in your inbox (stay with me for the moment), scroll through and ask yourself which of the many subject lines made you want to open the email and read it NOW – compared to others you waited to open, or maybe just deleted straight away. Make sure your subject line is – clear, concise, relevant and if possible includes a bit of curiosity. Remember the goal of your subject line is to get your emails opened, but at the same time it’s vital that it’s relevant to what you are talking about. Nothing will annoy your audience more than opening an email and discovering the content isn’t what they expected. Yep. The Postscript all the way at the bottom of your email. To be honest I’m not sure why this works, but research shows most people who open your email will at least read the subject line and the postscript. Therefore it’s vital that you include it in your emails. If they opened your email and only read the postscript you want to make sure it’s punchy and gives them an idea about what the rest of the email is about. Call To Action: What is it that you wanted them to do within the email. Read a blog post, click through to your Facebook Page, call you. Reminder them again within the PS. If the email is about a webinar replay the PS might be – Here is the replay link for you again. Testimonials: If your email is a selling email, then tell them about someone else who loved your product or service. Additional Information. Use this area to provide additional insight to encourage people to read the rest of the email. Benefits, guarantees, important dates. Urgency: When do they need to respond by. This can get people reading your emails now instead of later. Personal Touch: Your emails are sent from a person to a person. Connection is a must. You don’t have to limit yourself to just one PS, but I wouldn’t’ use more than three. They should complement your main email information and encourage the email scanners to take the time and read the rest of your information. Now we have people opening our emails, and reading the postscript. It’s important that we don’t confuse them. Many people, when using email marketing, use the ‘newsletter’ approach. This basically means they have a series of small paragraphs all about different topics. 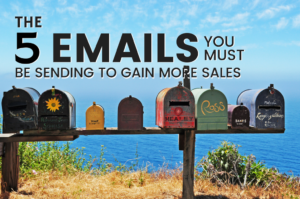 While this is great for newsletters and keeping in touch, it’s not going to increase your sales. Ideally when creating an email you need to focus on one single message. The same message needs to follow through the entire email, from the subject line all the way to the postscript! When you do this you are leading your customers on a journey, a journey with you about one particular topic instead of jumping around from one topic to the next. Imagine that you signed up to get information on growing organic coffee. The first email you read is about having the correct soil, the second email is about sourcing the best seeds and then the third email is about coconut oil. Coconut oil. That has absolutely nothing to do with growing organic coffee? What? Confusion overload. This is what happens when you try to address too many topics in one email. Keep the same single message from the start to the finish. This allows your readers to connect with you, your topic and it will increase your sales. Your potential customer has opened the email – great subject line – check, intriguing PS – check, single message – check. They are loving what they are reading and want more. But you didn’t tell them how. Yep. Sadly this happens all the time. People are ready to buy but you don’t tell them how. Each and every email you send must include a call to action. After they have read the email, what’s the next step? Provide people with a very clear, specific call to action and they will take that action. I aim to include one call to action per email and link to it at least three times within the email. As a business owner (and now a marketer) it’s your job to make it as easy as possible for your audience to buy from you. You are missing out on so much by not including a very clear and simple way for people to do more with you. Include a call to action each and every time. Did you like that call to action? What most people seem to struggle with when writing emails is the ‘right’ words. Phrases. Let me tell you right now. You don’t need to be an English Professor, good at spelling or grammar. Heck I’m not (I’m sure this blog has a mistake or two). The core purpose of your emails is to connect with your audience in a way that moves them to take positive action with your business – buy your stuff! And the very best way of doing this is to write like you talk. My best suggestion for ‘writers block’ is to grab your iPhone and open either voice memo or the Google Docs app and start talking. Voice Memo records your voice which you can transcribe later while Google Doc will type as you talk. Cool right! I’m sure you can talk to your customers about your products, services, your experience, your passion. That’s what your emails are doing. I know that when you use emails to their fullest advantage you can seriously leverage your time and increase sales. As mentioned above, it allowed me to take 4 months away from work while on maternity leave and it’s the driving force behind our business now. During the blog I’ve outlined the essential elements that should be included in each and every email you send. I’ve also put together an ebook that contains the specific emails you must be sending to increase sales after someone has enquired about your product or service. Remember as business owners it’s your responsibility to stay top of mind, connect with your audience and provide them with an opportunity to buy from you. Increase sales on autopilot with these 5 emails. (templates included) Enter your details below to grab your free copy.